The Madrid City Pass is a wonderful option for tourists to Madrid thinking of visiting the major museums and attractions. Once purchased, the card offers FREE private transfer from the airport, a FREE hop-on, hop-off city bus tour and discounts for Madrid museums, sights and tours, as well as priority access with no queueing to the Prado Museum and the Real Madrid Stadium Tour. 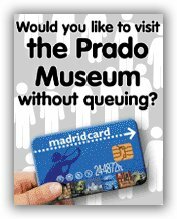 - Skip-the-line tickets for one of Madrid's busiest attractions (the Prado Museum) - saving you valuable time on your trip! - Everything online! You don't have to exchange or pick-up your City Pass on arrival. The Madrid Card is valid for 1 year after the date of purchase. It is then activated the first time it is used and expires at the end of the period selected. Once you have ordered your card, it may be collected either at Madrid airport, or at the Tourist Information Office (full details on purchase).